How old is Philippe Buache's map of New Discoveries? The University of Hawai'i at Manoa owns a copy of this map of the Pacific by Phillippe Buache. Its library record gives the date "Circa 1750"; I wonder if we can be more specific. The map shows ports in California that were not founded until 1769, though according to Erwin Gudde, the port names predate their foundation. It includes the legendary Pacific islands Rica de Plata and Rica de Oro as well as Los Jardines; I don't know when the existence of these places was debunked. A lower bound for the year is 1741, as the routes of Bering's second expedition in that year are shown; an upper bound could be 1773, when a book by Captain Cook brought Hawai'i to European attention. If Buache had known about Hawai'i, the map could likely have extended a little farther south to include it. Can other clues here help narrow in on when the map was drawn? The date depends on whether one is referring to date of completion or date of printing. The map was completed by April 1750 but the 1st edition was not printed until June 1752. Note the attribution is to Philippe Bauche [sic] AND Joseph-Nicholas de l'Isle. Buache was married to the daughter of the cartographer Guillaume de l'Isle, half-brother of Joseph-Nicholas. Fonte's entrance is at roughly 63°N latitude. In the face of criticism, De L'Isle published another map in September 1752 moving the entrance to 53°N, as the letters had stated. This caused a rift between De L'Isle and Buache, as the latter stuck to the initial misreading of the letters. 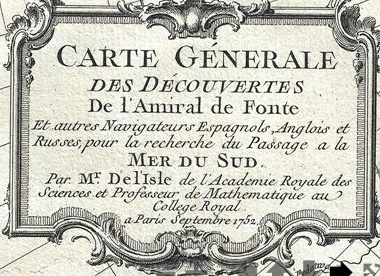 Presentee a l'Academie, dans son Assemblee publique du 8 Avril 1750. Par Mr. De l'Isle. 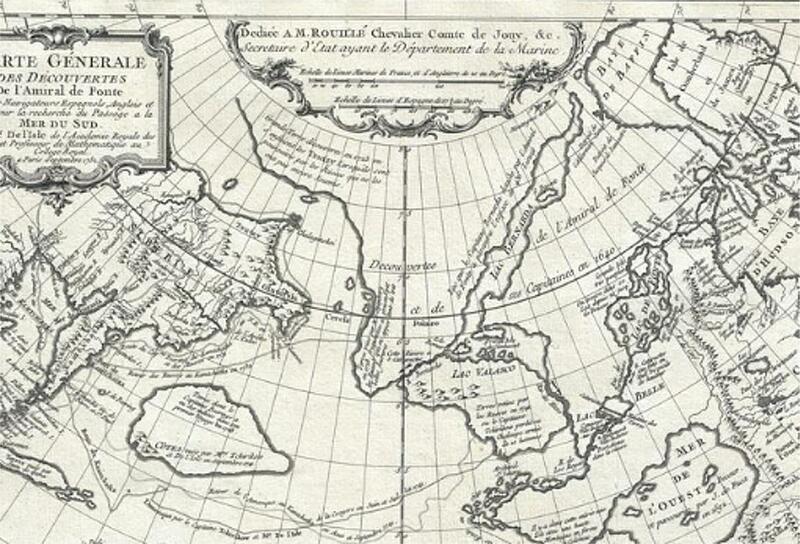 an unrecorded state of Joseph-Nicolas de L'Isle's (Delisle) map of the Northern Pacific Ocean and Arctic. and is attributed to 'The De L'Isle family' (which included Buache) and Jacques-Nicolas Bellin. Eau de Wager decouv. 1746 et 1747. ...first probed by Christopher Middleton in the early 1740s and supposedly one of the possible sources of a Northwest Passage. 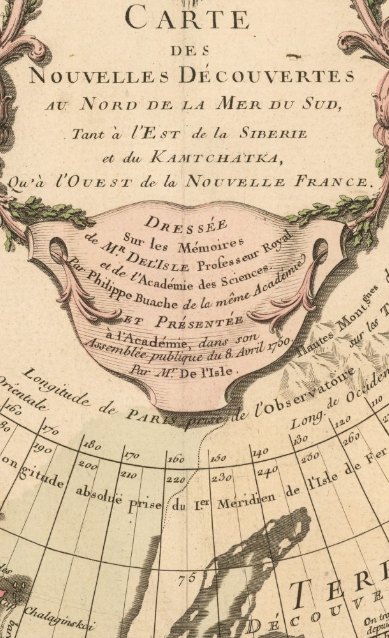 1747 is also when De L'Isle left Russia for Paris "with a large map collection". Presumably, he and Buache then started work on the copy which they presented on the 8th of April 1750. Perhaps worth noting is that de l'Isle had previously made a map of the Pacific in 1737. Not the answer you're looking for? Browse other questions tagged maps age-of-discovery chronology dating or ask your own question. In 1492, what was the shortest distance you could travel to discover the new world from the old world? How old were the youngest employees of the Russian-American Company?